Breast pain or mastalgia is one of the most commonly reported symptoms in women presenting with breast complaints. In a 2014 survey of the general population of nearly 1700 women, 52% reported regular episodes of breast pain and 17% rated their mastalgia greater than 7 on a scale of 10. The challenge is amplified by the fact that many primary care physicians are unsure of how best to manage patients with chronic mastalgia, which contributes to patient and physician anxiety. For patients, mastalgia may not only significant impact their quality of life, but also frequently evokes fear that the pain might be a sign of a developing breast cancer. As a breast cancer surgeon, I get the opportunity to evaluate many of these women to both rule out a diagnosis of breast cancer and help them find solutions to their chronic mastalgia symptoms. My evaluation begins with determination of the pattern of breast pain, which is relevant to assessing the underlying cause and possible solutions. Cyclic mastalgia typical happens in premenopausal who report pain lasting 5 days or more before the start of at least two menstrual cycles. Cyclic mastalgia is typically dull, burning, or aching pain, but may be sharp and shooting, usually involving one or both the upper outer quadrants. Noncyclic mastalgia tends to be of shorter duration (i.e., < 5 days), is almost always limited to one breast, and may fluctuate in intensity for no apparent reason. Proper diagnostic work-up of mastalgia includes physical examination and appropriate breast imaging evaluation to identify a structural breast problem. For women age 30 and older, proper evaluation of new onset breast pain includes mammography and ultrasound of the affected breast to identify a possible underlying cause. Ultrasound alone will suffice as the initial diagnostic study for women under age 30 or for older women with normal mammograms from the previous 6 months. Further work-up should be guided by the imaging findings. Indeed, the vast majority women with breast pain have completely normal breast mammograms and ultrasound and require no further imaging work-up. The most common structural causes of mastalgia are breast cysts, fibrocystic changes, and fibroadenomas. Breast cancer must be excluded although isolated breast pain is rarely a symptom of breast cancer. Underlying chest wall problems must also be considered, including costochondritis which causes pain along the sternal border that is exacerbated by deep breathing or coughing. Shoulder or scapular bursitis can also cause sensations of breast pain. Large breast cup size and ill-fitted and non-supportive bras may contribute to the development of breast pain, especially when associated with weight gain. For example, a patient with recent weight gain might benefit from upsizing her bra cup and/or band to a more comfortable size. Deep skin impressions or skin hyperpigmentation along the inframammary skin and sides of the breasts is a strong clue that the bra might be too tight. As it turns out, most causes of mastalgia are not structural, but physiologic, and are linked to excessive breast stimulation by hormones. Environmental factors such as smoking, caffeine, and nicotine, as well as physical or emotional stress may contribute to breast pain by increasing blood levels of epinephrine, norepinephrine, and dopamine. Mastalgia might also be a side effect of certain prescription medications, including estrogen or testosterone-containing hormone replacement therapy, oral contraceptive pills, digoxin, spironolactone, venlafaxine, antipsychotic medications, ketoconazole, metronidizol, cimetidine, and cyclosporine. Another physiologic factor that might contribute to mastalgia is a deficiency in essential or free fatty acids such as linolenic acid. A proper dietary balance between saturated and unsaturated fats (like linolenic acid) is important for maintaining the stability of the breast cells. Excessive saturated fat intake or deficient unsaturated fat consumption increases the sensitivity of breast tissue to estrogen. Iodine deficiency can also cause breast ducts to be more sensitive to estrogen. The solution to mastalgia depends on the underlying cause. For the most part, breast cysts and fibroadenomas require no further attention after the cyst has been documented by imaging or the fibroadenoma has been confirmed by ultrasound and possibly a needle biopsy. However, painful breast cysts can be aspirated with a fine needle to withdraw watery fluid to reduce cyst pressure and painful fibroadenomas can be surgically removed. 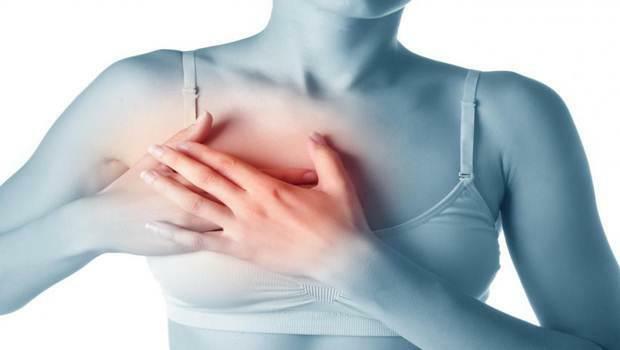 Musculoskeletal causes of breast/chest wall pain can be effectively managed with remedies to decrease inflammation. Costochondritis and shoulder bursitis respond well to a daily course of NSAIDs, warm compresses, and rest. Shoulder bursitis may also be treated with trigger point injection of lidocaine and corticosteroids. 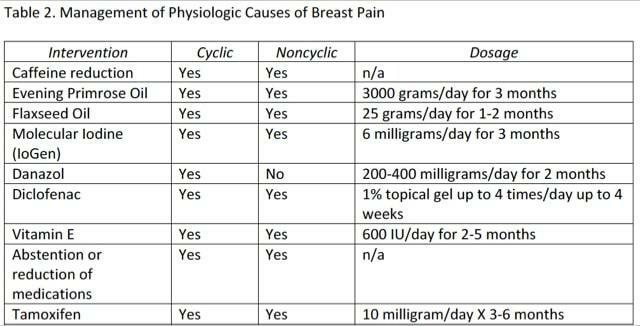 Management of physiologic causes of cyclic and noncyclic mastalgia included the following lifestyle and medicinal approaches that target the physiologic mechanism of breast pain. Caffeine Reduction. Caffeine and caffeine-like substances (generally called methyxanthines) are major dietary factors that may cause breast pain by increasing blood levels of epinephrine, norepinephrine, dopamine, and prolactin. Coffee, tea, and cola beverages are the key sources of dietary methyxanthines, but chocolate (dark chocolate more that milk chocolate) is another important source. Some studies show 60-80% rate of complete pain resolution following elimination of dietary methyxanthines. Evening Primrose Oil (EPO) or Flaxseed Oil. Deficiency of essential free fatty acids and/or excessive saturated fat intake contribute to the development of mastalgia by increasing the sensitively of breast tissue to estrogen. Essential free fatty acids may be increased by taking evening primrose oil or flaxseed oil, over-the-counter herbal supplements that contain linolenic free fatty acid. Lowering dietary saturated fat will help to restore fat balance and result in improvement of breast pain symptoms. Molecular Iodine Supplements. Evidence suggests the iodine deficiency makes breast tissue more sensitive to estrogen stimulation. Accordingly, iodine supplementation has been shown to improve breast pain in up to 70% of cases. Danazol. Danazol is a weak version of testosterone that inhibits estrogen and progesterone receptors in the breast. Danazol is the only medication that is specifically FDA-approved to treat mastalgia. Breast pain improvement has been reported in as much as 90% of patients. Though highly effective, unpleasant side effects (acne, oily hair, hot flashes, headaches, and excessive facial hair growth) tends to limits its use to more severe cases. Analgesics (Pain relievers). Non-steroidal anti-inflammatory drug (NSAIDS) may be used to decrease mastalgia while waiting for other interventions to take effect. The most effective NSAID for reducing breast pain is diclofenac (Voltaren) topical gel, which has been shown to decrease breast pain in 90% of users when applied to the affected area(s). Vitamin E. Studies examining the effect of Vitamin E supplementation on mastalgia have shown inconsistent results. Studies have shown improvement in up to 35% of patients, whereas others have shown no benefit. Abstension from medications. Table 1 shows prescription medications that may cause breast pain. Switching to an alternate medication or lower the drug dose, if possible, might help to relieve breast symptoms. Hormone replacement therapy is one of the most frequent causes of medication-related breast pain. Reducing the dose or giving the patients a drug holiday will help to manage hormone replacement therapy-related breast pain. Tamoxifen. Tamoxifen is an estrogen blocker that may be used to treat more severe cases of breast pain, producing significant improvement in 70-90% of women. Though effective, side effects (e.g., hot flashes, night sweat) and an association with endometrial cancer tend to limits its use to women with the most severe cases of breast pain that has been resistant to other interventions. The good news for women with chronic breast pain (and their doctors!) is that a large proportion of women with cyclic and non-cyclic mastalgia will experience spontaneous resolution of breast pain, most often due to menopause. Although some women will continue to have some degree of lifelong mastalgia, nearly all will experience significant reduction in breast pain frequency and severity with the lifestyle and therapeutic interventions outlined above. However, patience is required. Most of the interventions to reduce physiologic breast pain take several weeks or several months to show their effect. Therefore, the best results may be obtained by combining both short-term (e.g., analgesics) and long term measures (e.g., EPO) measures to reduce chronic breast pain.